Santa Maria del Mar, in the heart of La Ribera/El Born, is today surrounded by a web of streets full of trendy boutiques, restaurants and tapas bars. Each of these streets, however, still bears the name of the medieval trade once concentrated there. 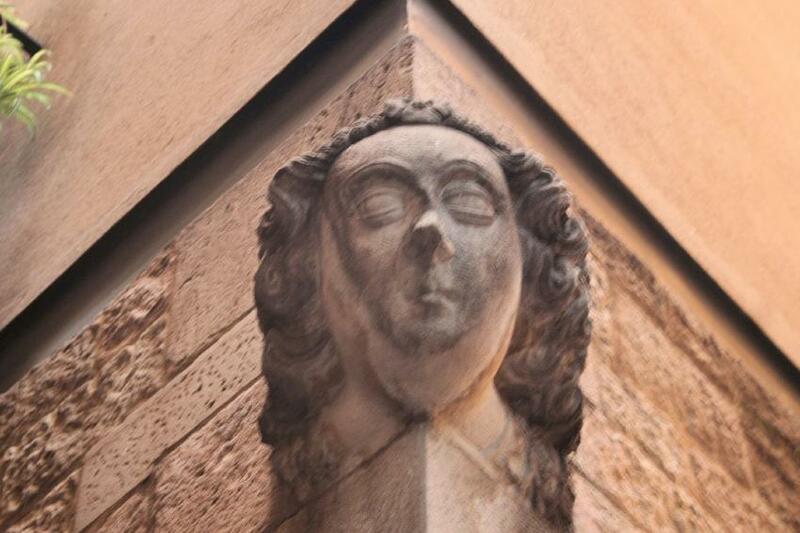 In the Middle Ages, shops would identify themselves by hanging out a model of their goods; all that remains of these are one or two of the stone female faces that marked the brothels. Walk up Carrer L’Espaseria for the famous view of Santa Maria’s campanile. This was the street of swordmakers, whose keen blades were as renowned as Toledo’s — looking at one was enough to wound, or so the Catalans claimed. From here Carrer dels Asses leads into Carrer de les Dames, 'ladies’ street', where hopeful spinsters gathered after bad storms; unmarried sailors often vowed to marry the first single woman they saw on shore if they survived. Pots and pans were the speciality in the adjacent Plaça de les Olles. Carrer dels Sombrerers along the side of the church was the realm of hatters; busy Carrer de l’Argenteria was the silversmiths’ street (up a block to Carrer de Basea and left, you can see the tallest surviving medieval tower house in the city). Behind the Gothic fountain (1402) in Plaça de Santa Maria is the quaint little Carrer de les Caputxes, scarcely altered since the 1400s, when Barcelonans came here to buy their hoods. Carrer de l’Anisadeta, south of Plaça de Santa Maria, was named for the woman who sold anise-flavoured water; off this, Carrer Canvis Vells and Carrer Canvis Nous were the streets where money was exchanged ('canvis') on bancos (benches, hence ‘bank’). 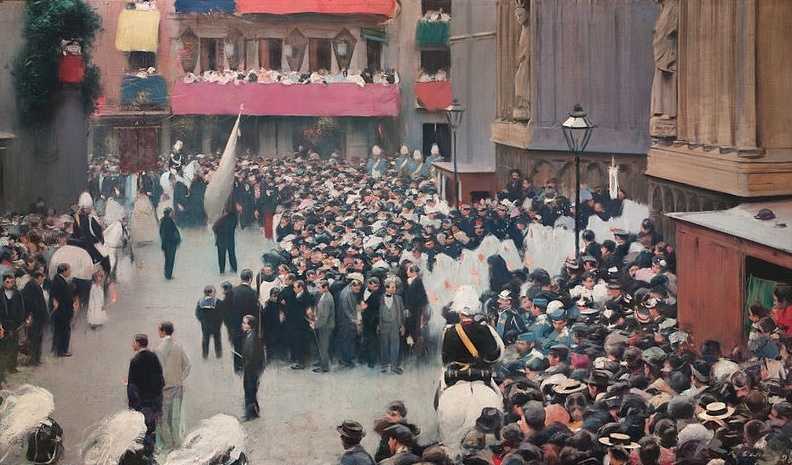 Carrer Canvis Nous witnessed the notorious Corpus Christi bomb attack of 1896; the procession had just left Santa Maria del Mar (as in the famous painting in MNAC by Ramón Casas) when a bomb was thrown at the rear, killing 12 poor workers and wounding many others, but missing all the bigwigs in front. There have always been suspicions that the bomb was tossed by an undercover agent, to justify the subsequent witch hunt of Anarchists and other suspects, who were subject to the tortures, mock trials and executions at Montjuïc castle that shocked the world. Just to the south of Santa Maria, a low wall and tall sweeping sculpture bearing a torch at its tip commemorate the dead, and the fan-shaped Fossar de les Moreres (the cemetery of Mulberry Trees) marks the mass tomb of Barcelonans who fought in the siege of 1714, at the end of the War of the Spanish Succession. Some 3,500 bodies were brought here; all who fought to defend Barcelona side were buried within a now vanished ring of mulberry trees, and all who fought for the Bourbons were buried on the outside. It will be the urn of honour. The plaque was removed after the Civil War, and reinstalled shortly after Franco died in 1977.